This introductory guide explains how to pull audio tracks out of video files using free software. I learned how to "rip" audio from movie files because I digitized some VCR tapes into MPEG-4 (.mp4) video files and wanted to listen to some of them as audio-only tracks on my Android device. This overview page and its two companion pages explain information you may want to know if you need something similar. Open the video file (File -> Open...). Export the audio file (File -> Export...). Extracting the audio with FFmpeg is accomplished by copying the file (or a portion of it) and stripping video and subtitle streams, resulting in an audio stream in the output copy. The main reason to extract with FFmpeg is because you get an exact copy of the audio stream that was inside the video file. There's no resampling loss because there's no recompression. You can extract a specified portion of the audio stream, but that's about the extent of editing you would do with FFmpeg. Convert the audio's encoding to another format. Compress to a smaller file size. Delete portions of the audio. Adjust the balance of a stereo track. 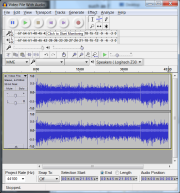 Convert a stereo track to a monaural one. Adjust the track so it plays back at the correct volume. Transcoding the audio means converting it from one format (say, AAC or MP3) to another audio format (say, MP3, Ogg Vorbis, or FLAC). You're also transcoding if you keep the original audio format but increase compression to achieve a smaller file size. MP3, AAC, and Ogg are "lossy" formats. When you transcode to a lossy format there will be some quality loss from recompression. Often, however, this quality loss is negligible or at least acceptable. WAV and FLAC are lossless formats that can sound exactly like the original, but with a much larger file size. Transcoding is easy. You simply open the video file and export an audio file. Audacity is a powerful audio editor and there are countless way you can change an audio track with it. Here are some common ways you can improve your ripped track before you export it. Delete Portions: Sometimes there are portions of the audio you want to chop out, silent gaps for example. Just highlight a portion you want to remove, then hit Delete and it's gone. Balance Adjustment: Sometimes stereo tracks are recorded out-of-balance. It's easy to fix incorrect stereo balance once you know how. First try normalizing the channels independently. If that doesn't bring satisfactory results you can always use Amplify on one of the channels to bring it to the correct volume. So there you go, extract if the audio track is good as-is or convert if it needs improvement. Either way you can enjoy optimally ripped sound files once you get the hang of the process. There's no substitute for practice when you're learning to optimize audio files. If you have some good headphones and/or high-quality speakers, consider listening with them when you're determining what compression level to use. If you're like me you'll want to keep your source files available a while and not delete them. Chances are you'll want to re-encode some of your early attempts, especially if file size is important to you.